The County is action-packed pretty much all year – not just the summer. 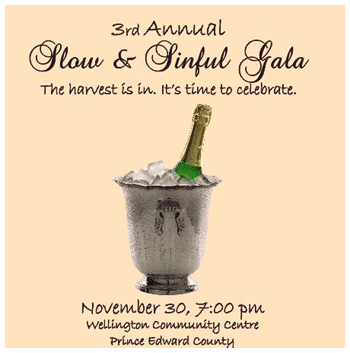 Check out the Slow and Sinful Gala, Slow Food Prince Edward County’s third annual tribute to locally produced champagne-style wines. November 30, 7pm, WELLINGTON, Prince Edward County. Sample bites from some of the County’s best chefs, alongside Loyalist College Culinary Arts students. Savory and sweet offerings paired with thoughtfully selected sparkling wines and specialty distillations. Little Bluff (my favourite County band) will delight with their bluesy-rock.